It's good news for all you chocoholics: eating chocolate does not cause pimples. There are no studies linking this sweet treat to the development of acne. There is no evidence that cocoa beans, from which chocolate is made, cause pimples. And while some point to the sugar that also makes up a portion of all chocolate treats, even that evidence is weak. Chocolate may be off the hook. But, these days, more attention is being paid to the link between diet and acne development. Surprisingly, it's not any of the "usual" culprits getting the blame. Instead of French fries, soda, or potato chips, it's things like dairy products and carbohydrates that are under the microscope. Even the most recent research on the diet and acne connection doesn't suggest that any specific foods cause acne in an otherwise clear-skinned person. Rather, it shows that consuming these foods may make existing acne worse for some people. Got a New Breakout After Eating Chocolate? 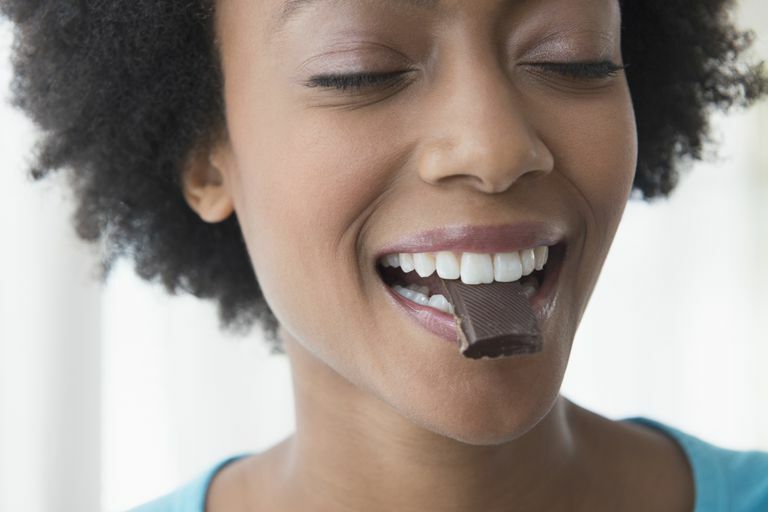 So, chocolate isn't on the short list of possible acne triggers. But what about that pimple you got the day after eating a chocolate bar? Most likely it's just a coincidence. You would have gotten that same pimple, chocolate bar or none. I know I get plenty of pimples without having a piece of chocolate ever cross my lips. Acne waxes and wanes on its own accord. Although we would love to ascribe blame for our latest breakout, the truth is it's often impossible to pinpoint a cause. Acne is a complex skin problem, and breakouts come and go without a specific cause. Food isn't the most likely culprit for your acne. The real causes of acne are a buildup of dead skin cells within the pore, an excess of skin oil (called sebum), and a proliferation of acne-causing bacteria. Hormones also play a role in acne development. That's why acne is so common during puberty and, for ladies, around the time of your period. "Acne Myths." AcneNet. 2007. American Academy of Dermatology. AcneNet. Ismail NH, Manaf ZA, Azizan NZ. "High glycemic load diet, milk and ice cream consumption are related to acne vulgaris in Malaysian young adults: a case control study." 2012 Aug 16;12:13. Manmood SN, Bowe WP. "Diet and acne update: carbohydrates emerge as the main culprit." J Drugs Dermatol. 2014 Apr;13(4):428-35.